Latin America: A Culture of Violence? You are at:Home»Regions»Latin America and Caribbean»Latin America: A Culture of Violence? On April 17, 2014, the United Nations Office on Drugs and Crime (UNODC) released its 2013 Global Study on Homicide. Once again, Latin American countries were ranked the most violent in the world. Central and South America captured more than a third of all global homicides, with the majority of those homicides occurring in the top five countries: Honduras (1), Venezuela (2), Belize (3), El Salvador (4), and Guatemala (5). With the exception of Belize, which is not considered a Latin American country, each country has sustained a top 10 Global Study on Homicide ranking since at least 2010, and Venezuela alone has had a consistently rising homicide rate since 1995. It begs the question, why is Latin America so violent? Some analysts have suggested that Latin America suffers from a “culture of violence.” While socialization into a violent environment can result in desensitization to violence, it does not provide an explanation for the presence of violence in the region, only the outcome. In addition, socialization does nothing to explain why the Latin American “culture of violence” is not present in countries such as Chile and Costa Rica—Latin American countries that have relatively low homicide rates in comparison to the global average. Other analysts blame the illicit market. In fact, the illicit economy has become an issue synonymous with Latin America. Its market is particularly lucrative with commodities that range from illicit narcotics (such as cocaine, heroin, and methamphetamines) and the precursor chemicals necessary to manufacture those narcotics (such as acetic anhydride), to counterfeit goods, weapons, and human beings. Currently, Honduras, Venezuela, El Salvador, and Guatemala are all dominant trafficking countries. Their geographical location is sandwiched between Colombia and Mexico, which are dominant narcotics producers, and the United States, which is a dominant consumer. In a separate report, the UNODC noted a correlation between areas of high trafficking and high homicide rates in Guatemala and Honduras. It also noted a correlation between territorial disputes over trafficking routes and high homicide rates in El Salvador. However, despite its harrowing effects, an illicit economy alone does not sufficiently explain Latin America’s homicide rates, since those rates are not present in other high-trafficking areas such as Central Asia and Europe. What provides insight into why Latin America is so violent are other factors simultaneously present with Latin America’s strong illicit economy: urban sprawl, lack of local governance, and lack of institutional capacity. The makeup of larger Latin American cities and capitals are the result of migration patterns that began in the 1940s. During this time, millions of rural workers moved to major cities all over the region, resulting in rampant urbanization and the growth of slums with up to half of the urban population residing in such slums—also known as urban sprawl. Many of these areas were formed without any local government present, let alone any structure of governance. Property rights were, and continue to be, established through squatting and other informal means. And any resulting disputes were, and continue to be, handled informally. Without regard to legality, gang organizations flourished as way to manage these informal relations, including business transactions, property transfers, and dispute resolutions. 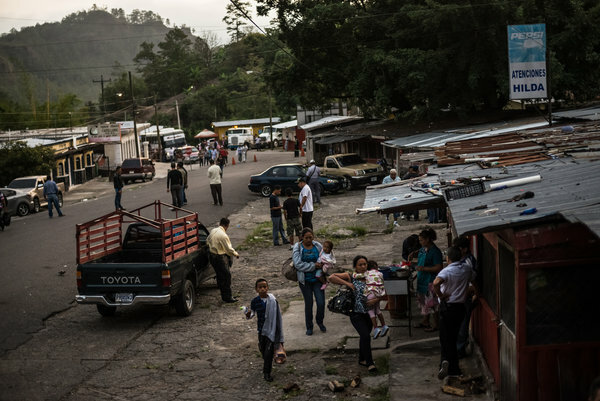 Without any mechanism to govern the disputes among gangs, gang violence in the “northern triangle”—Honduras, El Salvador, and Guatemala—skyrocketed. In addition, a lack of governing resources at the local level has been met with a lack of institutional capacity at the state level. The Transparency International’s Corruption Perception Index ranks Honduras, Venezuela, and Guatemala in the 70th percentile of the most corrupt countries in the world and El Salvador in the 47th percentile. To give an example, as recently as February 2014, Venezuelan Colonel Googlis Martín Caballero was caught trafficking half a ton of cocaine in the presence of his wife and daughter. This is obviously not his first attempt, as indicated by the level of comfort with such an act. Such impunity is met with a criminal justice system that is often times noted as weak and/or corrupt. Of the homicides reported in Latin America, only 24 out of 100 resulted in conviction rates, as compared to the global average of 43%. In fact, the UNODC highlights that since 2007, rising homicide trends have been met with a downward trend in conviction rates. Superficially, the 2013 Global Study on Homicide statistics suggest that the value of life is remarkably lower in Latin America than in other regions around the world. But a more in-depth look highlights factors such as a strong illicit economy, urban sprawl, lack of local governance, and a lack of institutional capacity that are all simultaneously present in Honduras, Venezuela, El Salvador, and Guatemala. If the region is to remedy its high levels of violence, much will need to be done at the institutional level, and in particular, at the local level. Liana Eustacia Reyes is a research coordinator for IBI Consultants, a national security consulting firm, and graduate student at New York University (NYU - Department of Politics and International Relations). She is an alumna of Florida International University (FIU) where she earned a Master of Arts in Global Governance (School of International and Public Affairs), a Graduate Certificate in National Security Studies (School of Public Policy), and a Juris Doctor (College of Law). In addition to NYU and FIU, Ms. Reyes has also studied at the University of London (Queen Mary School of International Arbitration), where she earned a Certificate in Global Arbitration. She has professional experience in the legal, business intelligence and investigations fields. And her research focuses on international affairs, law, and security, with regional emphasis on Latin America and Central Asia.